If you’re afraid you’re headed for a diabesity diagnosis, you’re probably not the only one. After all, the diabesity statistics are horrendous. More than a billion people worldwide are facing a diabesity diagnosis, including 50% of Americans over 65. According to a 2017 report published in Clinical Diabetes and Endocrinology, Diabesity is the largest health epidemic in human history. And why are you and hundreds of millions of other people afraid of a diabesity diagnosis? It is likely because of the terrible health consequences of diabesity. Diabesity is a fairly new term coined to describe the relationship between obesity and type 2 diabetes. Doctors had probably suspected a link between obesity and type 2 diabetes for many years before the link was “officially” verified in the mid-’90s. But the relationship between these two diseases is more than a mere link. They are interrelated. In fact, obesity is the main risk factor for type 2 diabetes. The Centers for Disease Control estimates that around 90% of those who are obese will eventually develop type 2 diabetes. And…statistics show about 90% of diabetics are obese. Sadly, you’ll rarely find obesity without diabetes and vice versa. This does not mean, however, that everyone who is obese also has diabetes. But what it does mean is that they likely have a certain level of insulin resistance that if left untreated almost always develops into type 2 diabetes. Though researchers verified the link between obesity and type 2 diabetes a few decades ago, they’ve only recently discovered a possible reason for this link. Many studies indicate obesity causes insulin resistance, which is a trigger for the development of type 2 diabetes. However, studies also indicate obesity is caused by insulin resistance. And sometimes type 2 diabetes occurs before obesity. In both cases, this is due to an elevated setpoint, which we’ll discuss shortly. While we don’t yet know why the brain, gut, and hormonal issues at the heart of an elevated setpoint show up first as type 2 diabetes in some people and as obesity in others, we do know that when one shows up, the other is soon to follow. Here’s how this works in both cases: A diagnosis of type 2 diabetes means insulin is building up in your bloodstream. This makes it almost impossible for your body to burn stored fat for fuel. That makes obesity almost inevitable. Similarly, a diagnosis of obesity means your brain, gut, hormones, or all of them can’t do their job to regulate weight. This leads to insulin building up in your bloodstream which leads to type 2 diabetes. Having diabesity means your metabolic system, which includes your brain, gut, and hormones, is so broken that you are at very high risk of heart disease, stroke, dementia, Alzheimer’s, Cancer, high blood pressure, amputation, blindness, and kidney failure. Doctors know the best way to prevent type 2 diabetes if you’re overweight is to lose weight. So, it makes sense their number one recommendation for avoiding a diabesity diagnosis is to go on a diet to lose weight. Taking off excess pounds is an excellent way to avoid a diabesity diagnosis, but the traditional way of losing weight that tells you to “eat less and exercise more” obviously doesn’t work. Has eating less and exercised more ever worked for you? No? It hasn’t worked for most other folks, either. More than 40 million U.S. adults go on a diet every year. The average American makes 3-4 weight-loss attempts per year. Americans spend more than $30 billion per year on weight-loss products. Yet, more than 70% of American adults are overweight or obese according to the Centers for Disease Control. Obviously, if diets worked, there would be no obesity, type 2 diabetes, or diabesity epidemic. Nobody would have a problem controlling their weight or blood sugar levels. The majority of people would be closer to a “normal” weight. Instead, millions upon millions of people are struggling with their weight. The result of their multiple-failed diets may have actually increased the obesity rate, which led to the astonishingly high rates of diabetes. In a recent report released by the Centers for Disease Control, 100 million American either live with diabetes or prediabetes. Sadly, traditional starvation-type diets only work for short-term weight loss. It is a biological fact you’ll lose weight when you slash calories. But it is also a fact, though not as well-known to the general public or dieting “gurus,” that the body fights back against what it sees as actual starvation. 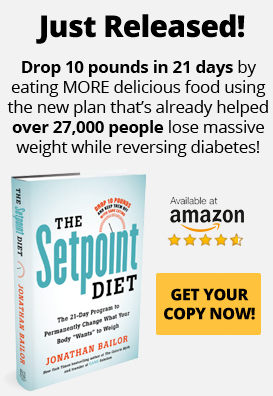 So what Is setpoint weight and how is it connected to Diabetes and obesity? The human body is a beautifully complex biological machine. Your brain, your digestive system, and your hormones all work together through a highly coordinated system to help stabilize your body weight and blood sugar—the same way they automatically stabilize your body temperature and blood pressure. Specifically, they “talk” to one another through various feedback loops to synchronize the activities that automatically maintain body fat and blood sugar at a specific level, otherwise known as your setpoint. Do you see how different this is from the traditional dieting mantra of “calories in equals calories out,” otherwise known as the calorie-deficit theory of weight loss? Rather than being like a scale, the feedback system that establishes your setpoint is like the thermostat in your house. Thanks to the thermostat, your heating or air-conditioning system respond to the weather outside and keep your home at whatever temperature the thermostat “thinks” it should be at. Similarly, your setpoint stimulates or suppresses your appetite and raises or lowers metabolism in response to how much fat it “thinks” you should store. If you go on a starvation diet while eating low-quality foods, your body’s metabolic alarm goes off (just like a thermostat responds when outside temperatures nose-dive to freezing). It signals your body that you are not consuming as much as you normally do. In response, your body demands more food and starts burning fewer calories. Appetite goes up, calorie burn goes down. This is why it seems like your body fights you every step of the way when you try to lose weight — and this is why you regain the weight quickly when you go off the diet. It is your body’s self-preservation mechanism at work. The only way you can lose weight long term is to lower your setpoint. Then, your body will automatically keep you at your setpoint weight. To be clear…calories are important, but it’s not your job to count them. Your body will take care of it as long as you give it high-quality fuel (food) and practice other high-quality lifestyle habits. If the body regulates weight, you are probably thinking, then why are so many people overweight or obese? It’s because their metabolic system has been broken. The factors that determine your setpoint — your brain, digestive system, and hormones — can no longer do their jobs properly. This hormonal clog prevents the hormones from sending proper signals to the brain. The brain, that controls everything, doesn’t know how much fat you have. It gives you more fat by default because fat equals survival. You need a certain amount of fat to survive day-by-day and to survive a long period without food if necessary. Everything you do affects your setpoint positively or negatively. The three main causes of an elevated setpoint, however, are diet, stress, and sleep deprivation. We live in a fast-paced, convenience-based society, and our diets reflect our lifestyles. Studies show the majority of foods in grocery stores, more than 70%, are heavily processed. Primarily located in the center aisles of the store, these foods are in cans, boxes, and packages. To ensure these foods maintain their long shelf life, manufactures fill them with sodium, sugars, and preservatives. Experts call these foods “ultra-processed,” and they are food-like “products” made to look, smell, and taste like real food. But they typically contain few nutrients and little to no fiber, as these nutrients are destroyed in processing. One study found more than 60% of the calories in the typical American’s diet comes from ultra-processed foods. In addition, this study discovered more than 90% of the added sugar in Americans’ diets comes from these foods. Ultra-processed foods, sugar, and refined carbs destabilize blood sugar levels, dysregulate hormones, inflame the brain, and feed “bad” gut bacteria — all of which elevate setpoint and make avoiding a diabesity diagnosis all but impossible. The solution? Go SANE and try to eat whole foods — avoiding heavily processed foods — as much as possible. Also, eat foods that have little to no effect on blood sugar. Non-starchy vegetables, nutrient-dense protein, and whole-food fats are excellent ways to lower setpoint weight. These SANE foods fill you up fast and keep you full for a long time, keeping you from eating inSANE heavily processed foods, sugar, and refined carbs. Many studies show chronic stress leads to weight gain, especially around the waist and stomach. This is because chronic stress causes the body to continually release cortisol to prepare the body to fight or flee the threat. And, because energy is needed for the fight/flight, the release of cortisol triggers a release of insulin to shuttle glucose into your cells. If there was really a threat, you’d face the situation. Fighting or fleeing would burn off the excess glucose. When the threat was finished, your glucose, insulin, and cortisol levels would return to normal. If you’re chronically stressed and your body is always releasing cortisol and insulin, however, cortisol and insulin levels remain elevated. Insulin is a fat storage hormone, and cortisol promotes weight gain, especially in the stomach area. Your glucose levels are also elevated because psychological stress does not burn off glucose. Chronic stress, then, causes chronically high levels of cortisol, insulin, and glucose circulating in your bloodstream. This elevates your setpoint and leads to insulin resistance that leads to obesity or type 2 diabetes and eventually diabesity. The solution? Try to do something every day to de-stress. Taking a long walk, soaking in a fragrant bubble bath, meditating, practicing yoga, walking the dog, playing with your children…all are great ways to release stress. Studies show most people in the U.S. get less than 6 hours of sleep per night. With such hectic lifestyles, it’s easy for most people to put sleep on the backburner. But research shows sleep is very important to health and to weight. Sleep deprivation causes weight gain. There are many reasons for this. One is that sleep deprivation dysregulates hormones, especially cortisol, contributing to an accumulation of belly fat and/or the tendency to crave and eat more refined carbs and sugary foods when sleep deprived. The solution? Try to get at least 8 hours of uninterrupted sleep per night. Eating SANE foods and living a SANE lifestyle is the easiest way to avoid a diabesity diagnosis. You’ll eat real foods, and you’ll eat until you’re full. No hunger, deprivation, or calorie counting required. In fact, the goal is to be so full of SANE foods that you’ll be too full to eat inSANE ones. Just start out slowly, replacing inSANE foods with SANE ones. You’ll be amazed at how great you’ll start to feel and how effortlessly the weight comes off and blood sugar levels come down. Before you know it, you’ll be completely SANE and loving it!